I've never flown a kite before. It's one of the things I missed out on as a kid and I'm not waiting til I have kids of my own to fly one! always wanted to do since a child. 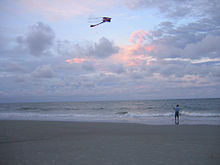 I've never flown a kite, i would even know what to do? Haven't done it since a family holiday back in the early 1980's. I think it was West Mersea in Essex but I remember it was a big green Peter Powell kite with a long yellow tail that inflated in the sky!